An updated rating of 0.5 to reflect the poor customer service. ** UPDATE** I have kept the original text of the review as the contents of the box were excellent, as well as the delivery. Sadly, I must change the rating of a 4.5 to 0.5 due to the shockingly unprofessional customer service I have received. Even though I had canceled my subscription ( in time, as per their guidelines), LookFantastic still debited my card for another month. I queried this and I got a standard reply, that it was now canceled, but I would still have to pay for the other box (there was no reason given, except I must have subscribed to it, I hadn’t). In addition there was no response for a day on Facebook, Twitter or via the contact form online. The facts are that it sent out unsolicited goods, did not provide an order number or confirmation of payment, debited payment without authority, and expected customers to accept that as a transaction. In addition you can save more if you sign up via Topcashback or Quidco you get cash back (£6 for a 3 month subscription, £10 for a 6 month subscription, and £21 for a yearly subscription. These are current rates and are subject to change). You simply sign up (it’s free) if you aren’t a member yet to join the sites, and then follow the link to LookFantastic. Cash back is paid via bank transfer, PayPal, or a gift card once £1 is earned. Ren: Wake Wonderful (sample size 10ml). An evening facial treatment with AHAs from the Radiance range. Value £8. Wet Brush (full size). A rival to Tangle Teezer destroying the myth you should never brush your hair when it’s wet. Value £11.99. Ioma: Optimum Moisture Cream (sample size 7ml). A day and night cream from a leading French premium skincare house. Value £11.41. Vichy: Liftactiv (sample size 15ml). A bestselling moisturizer from the anti-aging range. Value £9. Decléor: Aromessence Neroli Serum (sample vial 1ml). A rich facial serum made with 100% natural oils, from one of my favorite brands. Value £3. Revlon: Uniq One All in one hair treatment (sample size 9ml). A leave in treatment for dry hair, and to add shine and condition. Value £0.90. Eve Lom: Cleanser and Muslin cloth (sample sachet 5ml). One of the most famous cleansing balms on the market, and a cult classic. Value £8 approximately. Elle Magazine worth £4.10, June edition. Total perceived value £56.40 (approximately). While other beauty boxes may claim to have higher value boxes, this box contains products that are well known, and also are ones that I would use. The only exception is the all in one hair treatment, but I’m willing to try it as suggested with the Wet Brush instead of a conditioner. The value of the box is excellent given the quality of the products and coupled with the speedy delivery it is a recommended beauty box. I had been wanting to try this box for a while, but hesitated due to a lack of reviews from non PR samples (I spent my own money on this one, but used Quidco for some cash back), and the absence of offers for enticing me to try the box. Yes, there are discounts for longer subscriptions, but if they had offered a discount on the initial box, this review would have been written sooner and I may have signed up to a 3 or 6 month subscription. My apprehension also lay in the habit that some companies have of using substitutions. LookFantastic stick to the same brands with some variants, for example with Decléor you could get the serum, gel cream, or nutrition cream this month. At least everyone gets the same brands in each box, unlike other companies that are winging it by replacing an item that has run out with an old sample. While not wholly ethical it is in their stated (small print) terms and conditions. LookFantastic have Quidco to thank for offering a cash bonus for ordering this month, which persuaded me to try the beauty box. In addition the website sells an extensive range of products, and has special offers from discounts and 3 for 2 offers. Standard delivery is free for many countries, and the site often sends exclusive discount codes via email, but read the terms and conditions as well as the exclusions (which is quite a long list). Always check if a code works, and the site reserves the right to withdraw codes before they expire. Updated from 4.5 to 0.5 for unprofessional service. 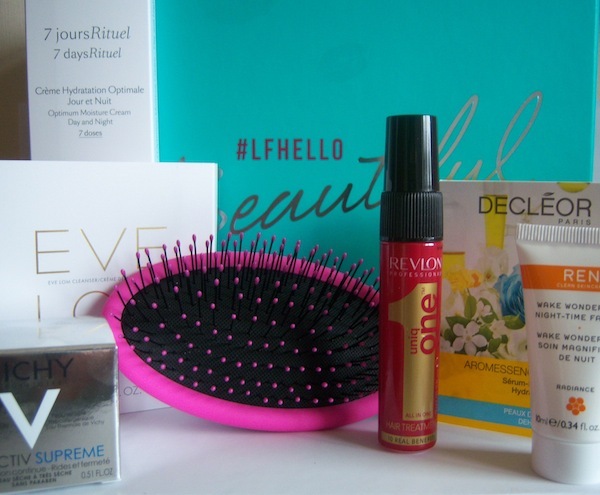 A good choice for a beauty box with tracked delivery, with quality brands and some special sample sizes. The website is easy to use, and there is an option to cancel the auto renewal in the account panel by the 23rd of each month. This month was good value with the Wet Brush retailing at £11.99, and the other items were a generous bonus.